Getting summer ready with the coolest swimwear selection. Official summer is right around the corner. Are you ready to kick the beach season off? I bet you aren't as you are still lacking few key swimwear pieces. If you never heard of Latvia-based Sin on the Beach and Russia-based NATAYAKIM labels, then you definitely missed a lot so far. Despite being too different in their concepts both brands seem to have found a really interesting and, well, developing niche to operate in. To say that the two names of beachwear industry have been my crush is to say nothing at all. Speaking of the swimwear industry you probably have been questioning on 'What are the new seasonal trends in terms of swimwear?'. According to Business Transworld, one-pieces are going to rock throughout the season, though don't take it as a huge NO to bikinis. We still want to get some good tan, right? So having a few different swimwear options is quite a good idea. Feminine florals, strong prints, colorblocking and a bit of retro style is what you should pay more attention to, says the Business Transworld. Still pieces that reflect SS15 trends, such as gingham, yellow color, fringe and so on can be found in the offering of both designer and high street labels. In order to put your pre-summer panic aside and save you some good time, our virtual tour of today is going to take you around the hot, really hot, seasonal pieces. So jump on, we are taking off! 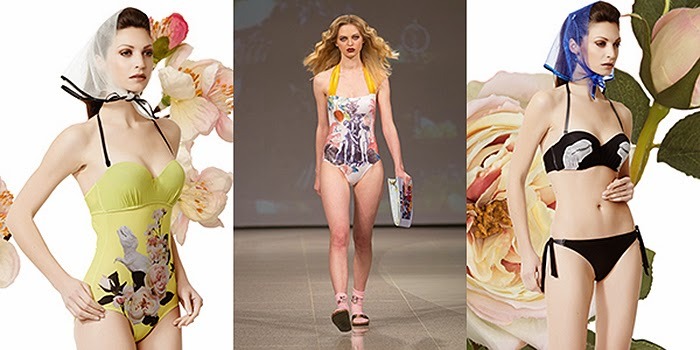 Latvia-based beachwear designer label, headed by Anna Kustikova, so far has released three collections all of which are available for orders. Sin on the Beach is famous for bold statement prints that are either inspired by '7 Deadly Sins' or a story of Adam and Eve. Such an approach with digital printing involved can't leave a real fashionista aside, I bet. Plus taking into consideration the seasonal swimwear trends, i.e. one-piece with statement prints all over, that can be found at SotB in abundance, I can't do anything else but recommend you to visit the online store of this yet fresh and creative Latvian label. NATAYAKIM is a Russia-based swimwear label founded by polish model Nataliya Yakimchik. Being a real swimwear addicted she once decided to start own line which resulted in four collections so far. High class and elegance that's what characterizes NATAYAKIM label, and 'mothers-daughters' trend as well. Swimsuits with a signature of polish top model are seen on Russian it-girl and model at the same time, Elena Perminova, and one of the leading intellectual females Ksenia Sobchak, to name a few. Colorblocking and juicy colors inspire us to add some more pieces to a summer wishlist. And go visit the official website of an emerging Russian label. Victoria's Secret is definitely one of bestsellers in terms of beachwear. Sensual seduction of VS Angels seen in all these bikinis and one-pieces makes us want to aspire to join the army of Angels. Even only in terms of the beach area. Sensual lines, tropical prints, bold colors, all black everything, retro touch, fringe, one-piece and separates - it all takes to describe a little piece of the seasonal offering from Victoria's Secret. What can create designers in terms of swimwear? A lot. Seriously, a lot. So many and all so different. Feeling dazzled... It's even hard to choose one out of all this endless selection, isn't it? And again the offering meets the forecast of the Business Transworld and seasonal trends, especially the ones we have a chance to cover so far. Mass market labels, like H&M and Topshop, and retailers, like ASOS, are pretty fast at offering equally fashionable pieces for more budget-friendly prices. Have to admit that in some cases mass market offering is much more beach fun, take, at least, the pineapple one-piece. Looks like pool party much. I love all black one on your post!